WASHINGTON, DC. 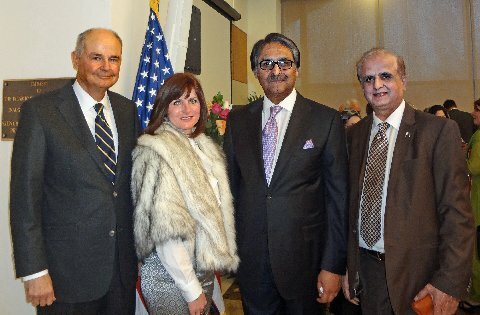 Pakistan and the United States reaffirmed close strategic partnership as top American diplomats and members of Congress attended a reception hosted by Ambassador Jalil Abbas Jilani to mark Pakistan Day. U.S. Special Representative Ambassador James Dobbins and Coordinator for U.S Assistance Ambassador Robin Raphael represented the Obama Administration at the gathering of high-profile officials from the Pentagon and several departments of the U.S. government.Congresswoman Sheila Jackson Lee, who is co-chair of the Pakistan Congressional Caucus, also attended the reception. The gathering also included prominent members of the Pakistani-American community, think tank experts, journalists and writersAmbassador Jilani and Ambassador Dobbins both underlined the importance of the vital cooperative relationship between the two countries. Pakistan and the United States have extensive relationship across a spectrum of areas,ambassador Dobbins stated. The United States remains one of the largest trading partners of Pakistan, with more than $5 billion in two-way trade.